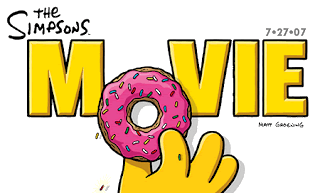 If you haven't heard, they're holding a contest to determine in which Springfield the Simpsons Movie premiere will be on July 27th. One of the 14 possible Springfields is none other than good ol' Springfield, MO! Each candidate city made a 5 minute film which can now be watched online and voted on to determine where the premiere will be. If you watch the Springfield, MO video and listen real close, you may be able to hear Stacey and me in the stadium shots booing and cheering! That's right, we were there! Yep, we're movie stars now (no autographs please). I've now spent over an hour watching all 14 clips, and, although I may be a bit biased, I think I have to say that Springfield, MO's is by FAR the best! Don't believe me? Check them out. Most of them are pretty craptastic (*cough* Florida *cough*). Anyway, even if you don't want to watch them, you should all still vote for Springfield, MO and then tell all your friends, family, and maybe even a distant acquaintance or two to vote for Springfield, MO too! It has to be Springfield, Mo...it just fits. I voted! Yeah!!! Thanks!!! We love you!!!! As an update, Vermont won. :( Oh well. Their video was one of the better ones. At least Florida got last!